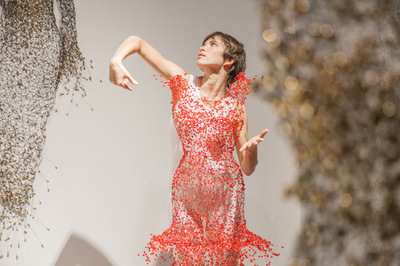 This performance is inspired by the work of the Korean artist KeySook Geum and her special wire and crystal dresses. While playing with the «Invisible Presence» in the Art+ Gallery, the artists are questioning the relation of the invisibility of being with the character of the costumes. A dress has the power to reveal or hide certain shades of human personality, and also to incarnate an identity itself made by a divine designer. 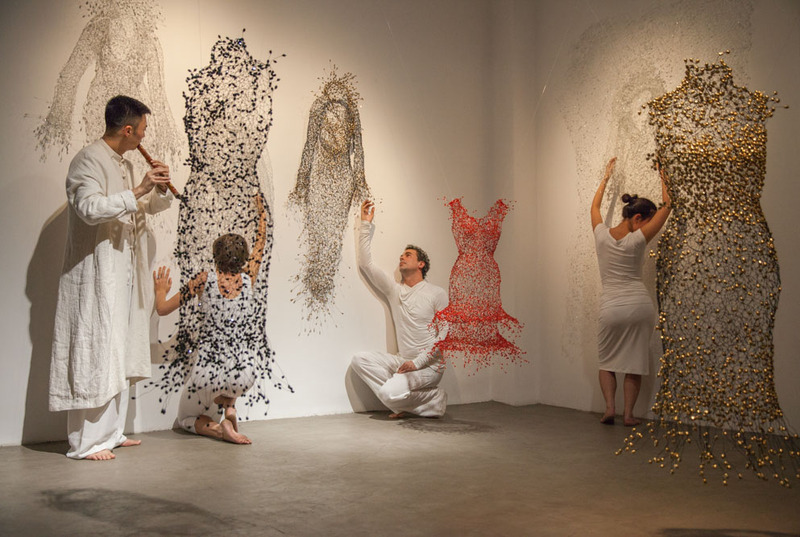 Three dancers and one musician play with this different relations between the visible and the invisible presence shaped by “Wire and Light” costumes. 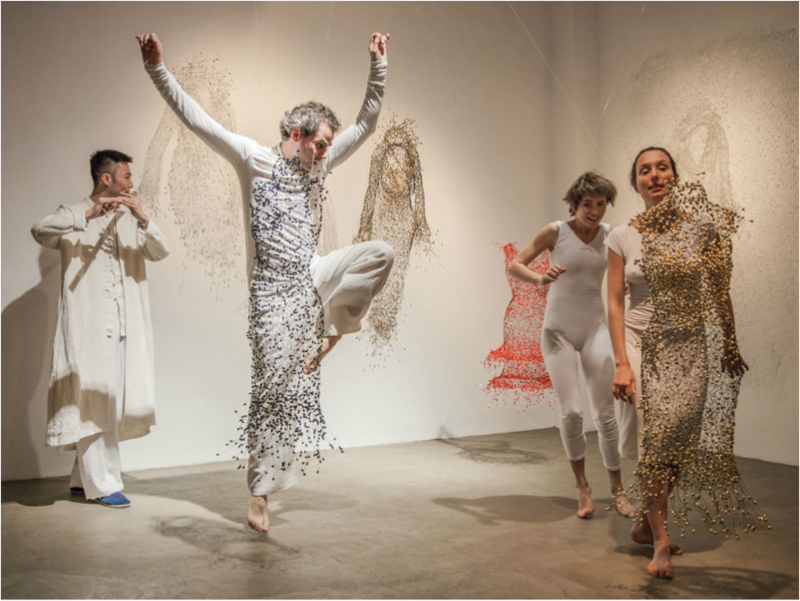 Qi Dance Project is a collective of artists and researchers focused on mind-body techniques, art education and site-specific performance. 4 artists compose the project «Invisible Presences» specially designed for the exhibition “Wire and Light” of the Korean artist KeySook Geum in Art+ Gallery. Director of the Qi Dance Project, Marceau holds a professor post teaching Dance and Martial Arts at the College of Physical Education of East China Normal University since 2009. He owns a Ph.D. on Anthropology of the Body, has over 15 years of mind-body techniques teaching (Judo, Qigong, Dance), and is actively involved in both the contemporary and traditional dance world in France and abroad. Marceau is the co-creator of the Qi Dance Training Method, a meeting between the oriental art of Qigong and western expressive tools from traditional and contemporary dance. 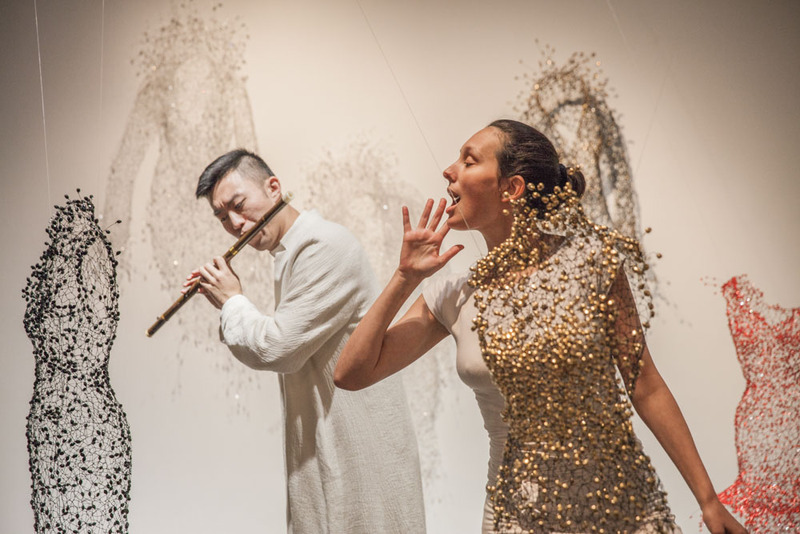 Rui Li is Chinese native and a performer of bamboo flutes. 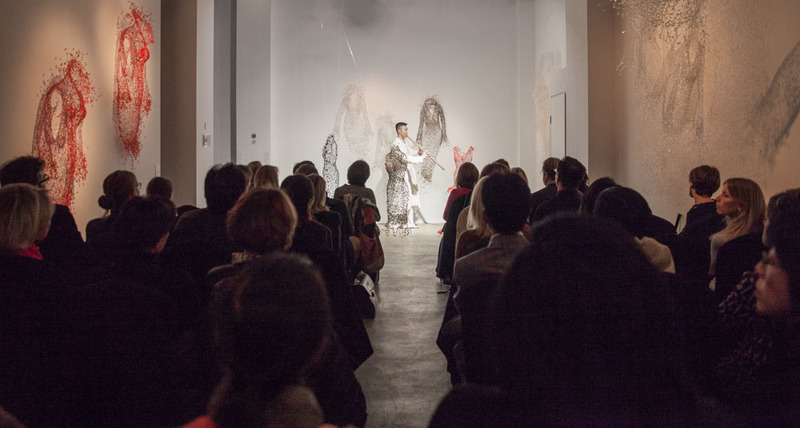 Rui is also a curator of Chinese classical music performances in conjunction with art exhibitions, dances, taichi, as well as other forms of arts. With a good mastery of Xiao flute and Di flute, Rui has worked with performers of various instruments including guqin, guzheng, ruan, etc. Rui Li is also a marketing professional and interpreter. He received education in China, US and Europe. Multi-disciplinary artist, and Arts and Culture manager, Estel is the founder of the Illumin8tors Arts Collective, and member of the Qi Dance Project since 2013. She arrived in Shanghai in 2006, after graduating from Translation and Interpreting Studies, attracted by the beauty and mystery of Chinese language and culture. 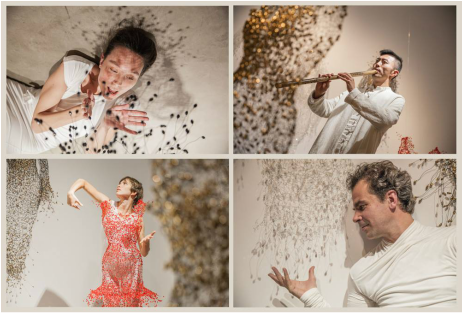 With a broad artistic background in music, dance, capoeira and creative writing, has been developing in recent years the integration of sound (mainly voice and flute) and movement in her dance, guided by the practice of spontaneous movement and qigong. a.k.a Menina is a visual and body artist, performer and educator, member of The Illumin8tors, an co-creative artistic collective. Her journey to China had begun a long time ago, even before she came to China to study in 2004, and then moved here in 2007. 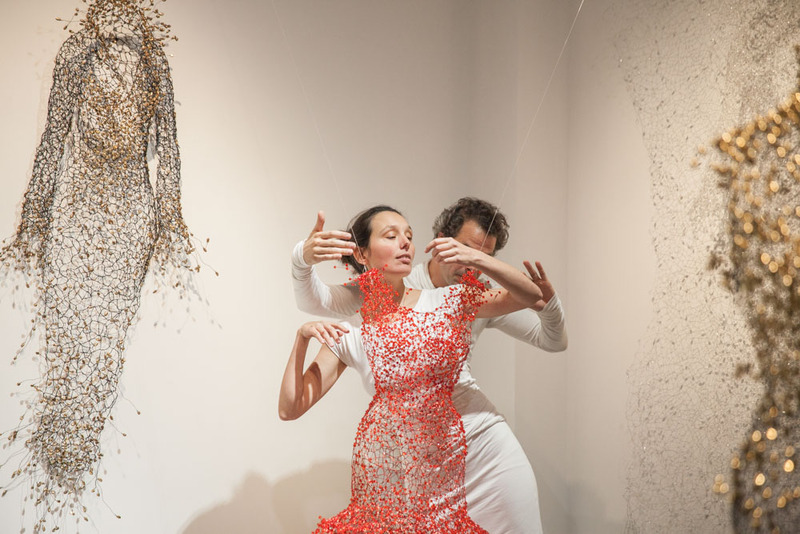 With her background of Chinese studies, Olga tend to explore artistic expression as a way of non-verbal communication through a multicultural approach. While studying contemporary art at China Academy of Art, she focused her research on the inter-cultural communication through dance, particularly emphasizing interactions between Chinese and Western cultures, which had definitely had an influence on her artistic works as well. Currently Olga is proceeding with her research, exploring Chinese body culture and its features displayed in dance and theatre. She leads an improvisation dance class in Hanghzou.